Tomorrow, nominations for the 2009 Children's and Young Adult Bloggers' Literary Awards open up and will remain open until October 15th. The panelists are being announced are gearing up to see what books in their genre are going to be nominated. I'm super excited to be serving again this year on the Middle Grade/Young Adult Nonfiction Panel. I can't wait to see what gets nominated! ATTENTION: This contest is now closed. Thank you for your entries! "When Winter, an Atlantic bottlenose dolphin, was found trapped with her tail badly damaged, she was not expected to survive. This is her miraculous story, from her rescue to learning how to swim again to her unprecedented success using a prosthetic tail. This is also a celebration of her indomitable spirit." Winter's story is one that I believe many children will truly enjoy. The copy is comprehensive yet written simply enough for a young reader to be able to understand. Full color photographs of Winter throughout her journey accompany the text on each page, giving children a close-up look at the lovable dolphin. In celebration of the book's release, one (1) reader will receive a Winter’s Tail prize pack! To enter, please leave a comment below by Monday, October 12, 2009 at noon, Eastern Standard Time. Receive an additional entry by linking to the giveaway on your blog. Please leave your link in the comments section. Receive one more entry for a total of three possible entries by linking to the contest on Twitter. Be sure to use @wellreadchild in your tweet. Meet Winter the Dolphin via Winter’s Tail Virtual Field Trip. Watch the live webcast on Wednesday, October 7, 2009 from 1:00 P.M. – 1:45 P.M. (ET). I'd like to offer a BIG THANKS to those of you who've signed up to host a Thursday in the coming weeks. There are still some November and December slots available, so please let me know if you'd like to host. This week my daughter and I have been enjoying Dr. Seuss. Before she was born, I bought a collection of Seuss books for her library, and only recently has she begun to show interest. The rhymes are perfect and silly, and the illustrations make her giggle. No wonder these books have been beloved by kids for years. The Cat in the Hat, Green Eggs & Ham, and One Fish, Two Fish, Red Fish, Blue Fish are her favorites! What are your kids reading this week? Leave your link in the comments below, and I'll post them throughout the day! Be sure to visit In Need of Chocolate next week for the roundup! Banned Books Week kicks off this Saturday, 9/26/09, and already there are some great posts talking about banned books and the importance of protecting our and our children's freedom to read. "If you are looking to get a head start on observing Banned Books Week, feel free to write to the schools involved with these challenges. PLEASE, I BEG YOU: be civilized and polite!! Our country is suffering an influenza of rudeness. Calling names and heaping scorn does not further discussions or change attitudes. It just builds the barricades higher. If you have personal experience with TWISTED, as a reader, a parent, an educator, or a librarian, please share those experiences (in a positive, constructive way) with these people." If you are interested in participating in Banned Books Week, check out the ALA's Ideas and Resources page to get even more ideas for addressing the issue and taking action. 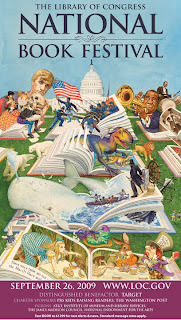 If you're going to be in the DC area next weekend or want to make a road trip, please check out the National Book Festival. It's free to the public! "The festival, which will be held on Saturday, September 26, 2009, is slated to feature over 70 best-selling writers, illustrators and poets. New this year, the Library is bringing the festival direct to mobile phone users with their first-ever mobile campaign. By texting ‘BOOK’ to 61399, mobile phone users can opt-in to receive the latest festival announcements as well as author presentations and signing schedules. The text campaign is one of many interactive features to bring booklovers up-to-the minute festival information. The Library’s Twitter feed (@librarycongress, hashtag #nbf) and Facebook page already have thousands of followers. Additionally, festival fans can now download author podcasts, which can be accessed free of charge through the Library’s website or on iTunes. The recordings feature candid interviews with award-winning authors George Pelecanos, James Patterson, Rickey Minor, Nicholas Sparks, and more. Finally, The Washington Post is hosting live online discussions in the week leading up to the festival with several participating authors, including Annette Gordon-Reed, Ken Burns, and Douglas Brinkley." Check out the Festival website for more info! Catching Fire is the sequel to The Hunger Games, and it truly is the book I’ve been most anticipating to read this year.It starts off a little slow, not that that’s a bad thing. It’s just not as fast-paced in the beginning as The Hunger Games. Katniss and Peeta are back in District 12 as the champions of the Hunger Games, and while their financial lives have significantly improved, they are both haunted by the events that transpired during The Hunger Games. At least Katniss finds comfort in the fact that her family is safe and well fed, and she makes an effort to help out Gale’s family as much as he’ll let her. As you can expect, things have changed between Katniss and Gale, and matters are also still unresolved between Katniss and Peeta. While things look good on the outside, the Capitol is furious about the stunt Katniss played in the Hunger Games that resulted in the first ever occurrence of two champions. The Capitol sees it as an act of rebellion, and there are hints of rebellion in other districts. After a threatening visit by President Snow, Katniss must decide if she will follow her heart or play the part of a girl who is in love with her fellow champion. This is when things really start getting good. A surprise twist of events fastens the pace, leaving me on the edge of my edge until the super duper cliffhanger ending. So, what did I think about the book? It definitely lived up to my expectations. I loved the twists and turns. I loved to see Katniss coming to terms with the way her mother acted when her father died, and I suspect that this will this develop in the third book. I also think that more of Katniss’s healing abilities to come into play, and she’ll realize that she’s more like her mother than she cares to admit. Of course, I did not expect this book to let us know who Katniss would choose—Gale or Peeta. Just when she’s leaning toward one, she starts feeling differently about the other, so I’m excited to see how that will play out. Personally, I’m on Team Peeta, but maybe that’s because I’d probably choose a baker over a hunter. What I thought was most interesting about the book was the detailed look at many of the districts and the fever of uprising that Suzanne Collins sprinkled throughout. I think the last book is going to be the darkest one yet, and Katniss is really going to face some difficult situations and have to make some tough decisions. My only problem with the book is the fact that I have to wait so long for the next one. I am so not good with cliffhangers, and this one was a doozie. Time for the latest edition of "What My Children Are Reading!" Here is what my little daughter and I have been reading recently. In this adorable board book, six animals from a cat to a horse are missing their feet, and children are challenged to match the feet on a turning wheel with the animals on each page. The wheel is easy enough for my daughter to turn, and this book has kept her entertained since we received it. To be honest with you, we don’t read the actual text that’s on each page. Instead, I turn the wheel and ask, “Is this the cat’s feet?” She responds by saying, “No, it’s not the cat’s feet,” and so on until we do find the feet. With this pattern, she’s able to “read” the book to herself and even read it to her daddy the other day. She was so proud of herself. A little boy named Felix takes a walk through the forest at night and encounters a frightening tiger, crocodile, and wolf. Luckily, he finds himself in the home of a rabbit who has a unique way to help Felix find his way home and frighten away the scary creatures. On first reading I was worried that my little one would be scared, but she absolutely loves the simple, yet engaging story, and Dorothee de Monfreid’s charming illustrations are well worth picking up the book. I reviewed this book last year, and recently introduced it to my daughter because, well, she’ll be getting her very own little brother this winter! When she first learned of the pregnancy, she didn’t really quite understand what was going on, so I brought out this book to see if it would help. It really did. 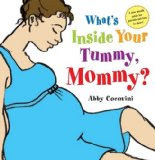 At 2 ½, she doesn’t really understand or care about the technical descriptions, so I just flip through the pages and show how the little baby in the mommy’s belly grows and grows. After a couple of readings, she pointed to my belly and informed me that a baby was growing inside and that it would get really big and come out. Sooo…I consider that a success. We have to look at the book at least once or twice a day now. So now that you know my news, I need your help! Things are going to get really busy really soon around here, and I’m already struggling with keeping up this “weekly” post that I sometimes only remember about on Thursday nights. I really love seeing what everyone else is reading with their kids, so I was hoping that some of you would be willing to host the meme on Thursdays not only to keep the meme going but to also get people linking to your blogs. If you’d like to host, leave a comment in the post, telling me which of the following weeks you’d like. I’ll post the schedule in my side bar, so everyone will know where to go. As a reminder, this is open to parents, grandparents, aunts, uncles, teachers, librarians, and anyone who reads with kids! Thanks, and I so look forward to hear what your kids have been reading this week! On October 1, nominations for this year's Children's and Young Adult Blogger Literary awards (Cybils) will open up. Check out the Cybils site for news and information. There's already a lot of great content up, so don't wait until October 1 to visit. There simply aren't enough children's books that feature interracial characters, so I did a little happy dance when this one arrived in my mailbox. In I'm Your Peanut Butter Big Brother a little boy talks to his soon-to-be brother or sister and imagines what he or she will look like. He himself is a blend of "semisweet dark Daddy chocolate bar," and "strawberry cream Mama's milk." The result? A "peanut butter big-brother-to-be." Will the new baby be "coffee with lots and lots of cream," "ginger cookie brown," or "midnight licorice purple"? The boy goes through the colors of his playmates and family and then imagines what the baby's hair, eyes, and lips will look like. Vivid illustrations match the equally vivid descriptions, resulting in a book that celebrates the rich diversity within a family. This would make a great choice not only for interracial families who are expecting a new baby, but I also think for any child who is going to be a big brother, sister, cousin, etc. I haven't met many expectant mothers, fathers, or other family members who aren't curious about what a new baby will look like and who he or she will resemble, so this book could serve as a great discussion starter with children about what the new baby-to-be will look like. It's also portrays a very positive image of diversity, which makes me super happy to see in a children's book. I've been a bit uninspired by some of the books I've recently read and haven't found any review worthy. I hope to be back soon with some great recommendations for you. In the meantime, please check out the books that won this years Parents' Choice Awards. They're organized by genre. While you're at it, check out of the children's magazines that also won awards.